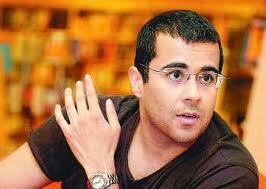 Mumbai, April 15 (IANS) IIM-Ahmedabad alumnus, author Chetan Bhagat, whose book "2 States" is being adapted into a movie, says the movie is perhaps the first to be shot on the prestigious institute's campus. "Just learnt '2 States' is possibly the first Bollywood movie to have ever been shot at the IIM-A campus," tweeted Bhagat, who felt emotional about setting foot at the institute. "At the IIM-A Students' Mess. Shot being composed. Unable to describe the feeling. Time travel of sorts," he added. Directed by Abhishek Verman, "2 States" is being co-produced by Sajid Nadiadwala, Karan Johar, Gauri Khan and Shah Rukh Khan. The movie stars Arjun Kapoor and Alia Bhatt in the lead roles. Bhagat last wrote the screenplay for Abhishek Kapoor's "Kai Po Che! ", an adaptation of the author's own book, "The 3 Mistakes Of My Life". Earlier, his bestsellers "One Night@The Call Centre" and "Five Point Someone" were made into movies "Hello" (2008) and "3 Idiots" (2009), respectively. In fact, "3 Idiots" was shot in IIM-Bangalore.